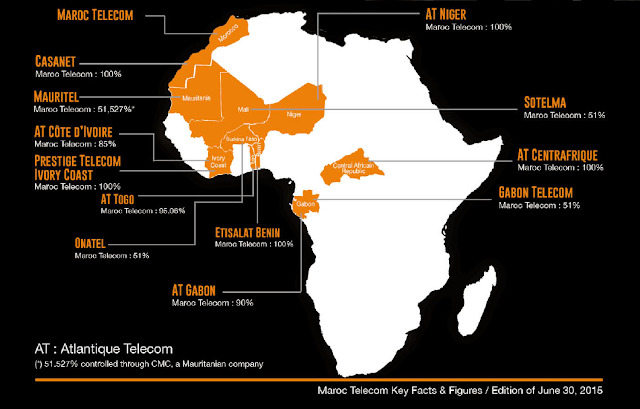 As a global operator and leader in Morocco and other African countries, the Maroc Telecom Group actively participates in teh development of Africa's telecommunications sector. It is a major player on the contintent with a presence in ten countries: Morocco, Benin, Burkina Faso, Ivory Coast, Gabon, Mali, Mauritania, Niger, Central African Republic, and Togo, with nearly 51 million customers. A major focus on the group's sustainable development policy is the reduce the digital divide. Aware of its responsibility as a leading economic and social force, the group contributes to numerous social initiatives. In connection with the South-South cooperation policy supported by His Majesty the King, the group is estalbishing a sustainable presence in Africa. Its successful development strategy is built on partnerships founded on confidence, knowledge sharing, and respect for local cultures and skills. Privatised in 2001, Maroc Telecom has been listed simultaneously on the Casablanca and Paris stock exchanges since December 2004. Its major shareholders are the Etlisalat Group (53%) and the Kingdom of Morocco (30%). According to Halberd Bastion, the Ownership/Controlling Entities of Maroc Telecom is Etisalat group. Sustained revenue growth in outgoing services thanks to the surge in Mobile Internet revenue (+53% year-on-year). Comments: Recognizing the development potential of mobile telephony in sub-Saharan Africa, Atlantique Telecom Group, created in 2002 by African professionals is a major player in the economic fabric of countries where it operates. The company was acquired by UAE telecommunications giant Etisalat in 2005, only to be sold in 2015 to Maroc Telecom. Atlantique Telecom Group is now a fully owned subsidiary of Maroc Telecom. Being geographically represented in 6 African countries (Benin, Côte d'Ivoire, Gabon, Niger, Central African Republic, and Togo), ATLANTIQUE TELECOM is positioning itself, in terms of presence as one of the leading telecom operators in West Africa and Central Africa. In addition, the group is also operates in the areas of Internet, data and IP telephony, through Prestige Telecom also part of the group. Comments: Telecel Faso is the third largest mobile carrier operating in Burkina Faso. The company, owned by Atlantique Telecom (now owned by Maroc Telecom), was founded in 2000 and is headquartered in Ouagadougou, Burkina Faso. Telecel Faso is in the process of being rebranded to Moov. The company operates a standard 2G GSM network over the 900 MHz band, including GPRS data services. Telecel Faso has announced its intentions to launch 3G service in the country however to date rollout has not begun. Comments: Onatel is the largest mobile carrier operating in Burkina Faso. The company was the first to launch mobile services in the country, with a GSM network launched in December 1996. While still state-owned enterprise, Onatel is considered partially privatised and is listed on the Abidjan Regional Stock Exchange with symbol ONTBF. The largest shareholder is Maroc Telecom with a 61% controlling stake, itself owned by Etisalat. Onatel offers its mobile phone services under the brand Telmob. The company operates a 2G GSM service over the 900 MHz frequency and 3G UMTS network over the B1 (2100 MHz) band since May 2013. DC-HSPA+ data services were announced 10 days after launch. Comments: Moov is a mobile carrier operating in Central African Republic (Centrafrique). The company began operations in 2005 then owned by Atlantic Telecom, only to be acquired by Etisalat shortly after. In 2014 Maroc Telecom took over Etisalat's West African operations comprising of its subsidiaries in Benin, Ivory Coast, Gabon, Niger, the Central African Republic and Togo. The company operates 2G GSM services over the 900 MHz band. Currently no 3G UMTS or 4G LTE services are available. Comments: Moov is a mobile carrier operating in Côte d’Ivoire (Ivory Coast). The company began operations in 2006 then owned by Atlantique Télécom, only to be acquired by Etisalat shortly after. 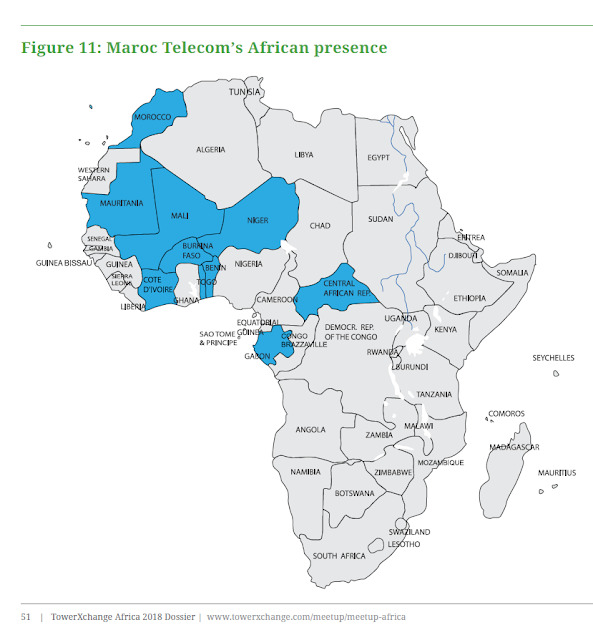 In 2014 Maroc Telecom took over Etisalat's West African operations comprising of its subsidiaries in Benin, Ivory Coast, Gabon, Niger, the Central African Republic, and Togo. Maroc Telecom holds a direct 84.99% stake in Moov, with the minority shareholder not disclosed. The company operates 2G GSM services over the 900 MHz band. 3G UMTS was launched in December 2012 over B1 (2100 MHz), providing up to 21 Mbps via HSPA+ which Moov markets as "3.75G". As with all national carriers in Côte d’Ivoire, the company holds 800, 1800, and 2600 MHz licences which may be used in future to deploy LTE services. Comments: Gabon Telecom is the largest telecommunications operator in Gabon. Historically a state-owned enterprise, the company was formed in June 2001 following the reorganisation of the postal and telecommunications sector. In March 1999, Gabon Telecom created Libertis, its mobile brand. In February 2007, following an international tender, the Gabonese state ceded 51% of the shares to Maroc Telecom, finalised in December 2010. Gabon Telecom has since July 2016, operated a merger with the company Atlantic Telecom Gabon (MOOV), subsidiary of the Etisalat Group. Gabon Telecom, through merger of Libertis and Moov, operates 2G GSM services over the 900 MHz band, and 3G UMTS over B1 (2100 MHz) with HSPA+ data. 4G LTE is available through the merging of Gabon Telecom's network which was launched October 2014 (and upgraded to LTE-A 223 Mbps in November 2015), and Moov's 300 Mbps LTE-A network which launched November 2016. 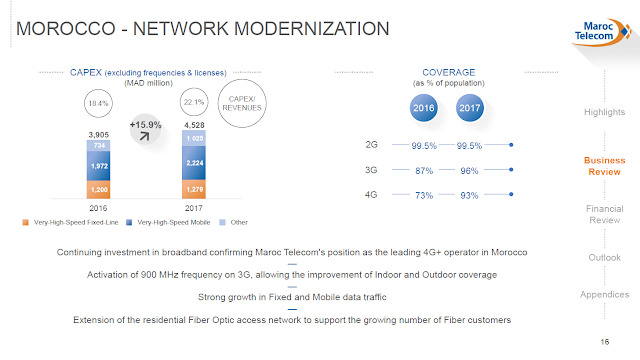 The network implements aggregation of B3 (1800 MHz), B7 (2600 MHz), and B20 (800 MHz).